Get ready to rock with us this summer! 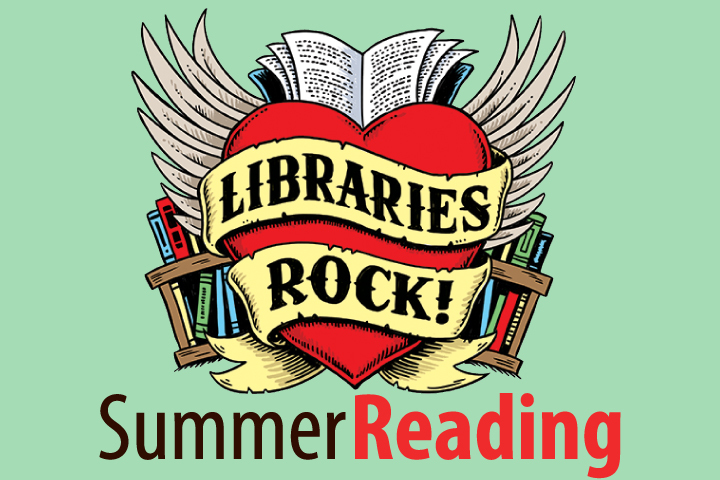 Deschutes Public Library is taking the summer reading theme of “Libraries Rock” and running with it. Enjoy the innovative beats of the two-necked guitar, an unbelievable one-man orchestra with Lipbone Redding and the Public (ROCK) Choir. Get down-to-Earth with gems and healing and opals. You can even play Libraries Rock Trivia; we’ll draw weekly winners of a free book for teens or adults at each library. All programs are free. Discover how some people use rocks and crystals to assist transformation and healing. Come prepared to get your hands a little dirty and to actually meet and interact with the rocks, minerals, crystals and gemstones we are learning about. Opals are spectacular gemstones that come in a variety of colors that can rival diamonds, rubies, and emeralds in intensity. But not all opals are of gemstone quality. Many opals lack the brilliant color and "fire" of gemstones, but occur much more frequently. You probably encounter opals every day in central Oregon, without knowing it! Come unleash your inner rock star and sing your face off! At the Public (ROCK) Choir you can be part of a group singing experience unlike any other in Central Oregon. Belt out rock and pop favorites, without feeling self-conscious or worried about who can hear you and who’s watching. It’s not about being a great singer, it’s about joining our collective voices and singing our faces off because it’s good for you and it feels good too. Singer, songwriter, guitarist, “voice-stramentalist” and former subway musician, Lipbone Redding is an entertainer like no other. A one-man orchestra with no electronic effects, his natural human sounds of throat singing, bass and beat-boxing, and his astonishingly realistic lip-tromboning are a must-experience piece of entertainment. From Plymouth Rock to the Hope Diamond, Deschutes Public Library’s very own community librarian Nate Pedersen explores history’s famous rocks. From infancy to adulthood and into old age, songs about the moon comfort and inspire. Enjoy listening to haunting “moon songs” both familiar and global! Yolanda Alicia will sing songs from Brazil, Venezuela, Mexico and the U.S. Cellist Billy Mickleson brings his unique arrangements and creative style of accompaniment. A bit of this presentation will be a sing-along. A display of moon-inspired children's books and poetry will be on view. Mark Kroos plays two guitar necks at the same time. Originally from Lansing, Michigan, but currently based in Charlotte, North Carolina, Kroos is one of the only people in the world touring his trade. His primarily instrumental style is characterized by open harmonies, polyphonic textures, and tapping technique, and is as entertaining to watch as it is to listen to. Live performances burst with energy and magnetism not typical of solo guitar music. What happens when Shakespeare’s words meets piano rock? Play: Songs from Shakespeare is a CD release that combines words from Shakespeare’s Hamlet, A Midsummer Night’s Dream, and Romeo & Juliet put to sophisticated songwriting of piano rock that only Here Comes Everybody can deliver. Here Comes Everybody was conceived by founding members Michael Jarmer and René Ormae-Jarmer in 1986 and has been rocking the greater Portland and the Pacific Northwest ever since. For more information about these or other library programs, please visit the library website at www.deschuteslibrary.org. People with disabilities needing accommodations (alternative formats, seating or auxiliary aides) should contact Liz Goodrich at 541-312-1032.